Do you miss having a horse in your life? Are you looking for the perfect gift for the horse lovers in your life? If you answered yes to either of these questions, you are going to love the Horse Tales for the Soul series of books. This is the first in the series of seven amazing books that are filled with true, horse stories from horse-lovers around the globe. Each story focuses on the life lessons learned or taught through the experience with their horse. Stories included came from riders as young as nine years old and from horse lovers in their 90s. All breeds of horse and styles of riding are included in the stories and authors come from all backgrounds from beginner to Olympic level riders. These are true stories from horsemen around the globe that are sure to touch your heart and warm your soul. 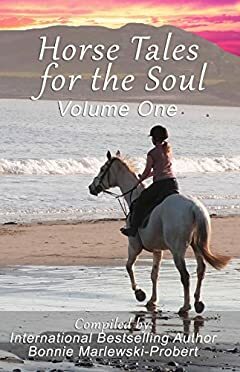 Horse Tales for the Soul, Volume 1 includes 45 stories from horse lovers around the globe. The book is divided into seven chapters, each of which focus on the life lessons that were learned through their experience. From Overcoming Adversity to Gratitude to learning how to say good-bye and finally, New Beginnings, this book is sure to give you hours of enjoyable reading, reminding you of the adventures you have shared with the horses in your life. Whether you are riding today or no longer riding, these books will remind you of why you love the Horse so much!